Arrive at Pearl Beach. Jump on our shuttle up the hill. Intro skills & ride the ridge-line. 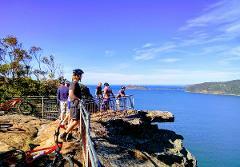 Enjoy spectacular lookouts! Descend the all downhill trail to Pearl Beach. Jump on our shuttle and repeat! Fun for all skill levels! Kids 1/2 price! This fun & supported ride offers incredible mountain biking experiences in a pristine National Park . 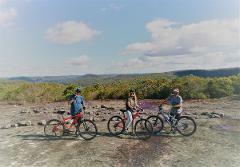 You will love the serene fire trails, immersive single track and incredible views out over bush and water. All inclusive with bike hire. This Mountain to Surf extended experience is suited to mountain bike riders ​who like a fitness challenge. Experience the scenic National park, far from human civilisation, ​with incredible 360 degree views of trees and rolling hills.